Gorongosa National Park in Mozambique was once a safari destination of choice for celebrities from around the world. Former Hollywood actors John Wayne and Joan Crawford are rumored to have been photographed close up with lions. The unique ecosystem where the Great Rift Valley of Africa meets the Miombo-Mapane forests was home to abundant antelopes, lions, elephants, and rhinos. While the field and its practices have changed since those years, the importance of Gorongosa for environmental conservation remains undisputable. Unfortunately, like the communities surrounding it, this safari paradise was devastated by a bloody and brutal civil war that lasted for decades. During this time, the wildlife of Gorongosa was all but exterminated by the combination of desperation of people trying to survive in a war zone, the ready supply of guns, and the global demand for elephant tusks and other animal products. When the Peace Accords were signed in 1992, the devastation of a long conflict left scars on both people and wildlife. When American philanthropist Greg Carr visited Gorongosa National Park in 2004, he saw the sweeping vistas where you could once see 20 or more species of birds at once and large herds of waterbuck that belied the high density of lions. This park was a place that could serve as an economic driver for the region, helping to lift people who were barely surviving out of dire poverty. The ecosystems that supported tremendous biodiversity remained, but the big animals were missing. Over the past 12 years, the Carr Foundation has invested millions of dollars to revive Gorongosa National Park and the communities that surround it. They reintroduced elephants, buffaloes, wildebeest, hippos, zebras, and eland. With the ecosystem intact, many of the animals have thrived and multiplied showing the incredible potential of nature to recover when given the opportunity. With tourism returning, people from the local communities have jobs and the park is able to provide 20% of revenues back to local communities that supports education, health and other development activities. In 2008 the GEF joined in supporting the revitalization of Gorongosa by funding the UNDP/GEF “Sustainable Financing of the Protected Area System in Mozambique” project. The project aimed to strengthen the overall effectiveness and sustainability of Mozambique’s protected area system through working partnerships between public, private, NGO and community stakeholders. The project also included activities that supported conservation and promoted development in surrounding areas such as a reforestation and shade coffee program, which brought tangible benefits to communities around the park. The farmers on Mount Gorongosa have the ideal altitude and climate to grow coffee, but it had never been introduced until recently. Shade grown coffee can encourage reforestation and provide a good income for farmers who previously were growing low value crops like corn. The civil conflict has heated up again with Mount Gorongosa as the base of the opposition, which has made continuing the project difficult. However, because the project staff come from the two sides of the conflict, those aligned with the opposition have continued to care for the tree nurseries at real risk to themselves, as they believe in the importance of their work. They also know, like all the people in the area, they will need a means of sustaining themselves when, hopefully soon, this round of conflict is over. In August, a GEF delegation visited Gorongosa National Park to see progress of the project and discuss Mozambique’s participation in the GEF’s International Wildlife Trade initiative (also known as the Global Partnership on Wildlife Conservation and Crime Prevention for Sustainable Development or the Global Wildlife Program). Funded by the GEF with the World Bank as a lead agency, the initiative includes Botswana, Cameroon, Ethiopia, Gabon, India, Indonesia, Mozambique, Republic of Congo, Tanzania, and Zambia. 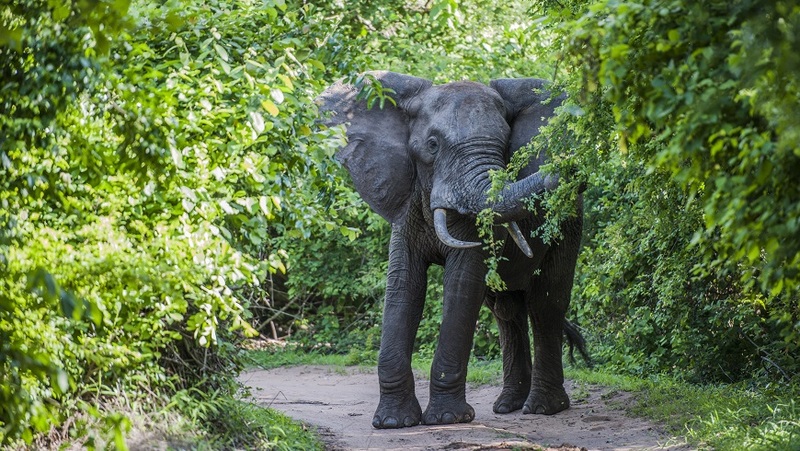 In Mozambique, the new project under the initiative will support a significant expansion of Gorongosa National Park as well as the development of a training center for park rangers from across the country to acquire the skills they need to fight poaching and manage natural resources. As attention has been drawn to the plight of elephants and other animals threatened by international trade at the recent CITES meetings in South Africa, the GEF is supporting fighting on the ground through anti-poaching projects across Africa that integrate conservation and development and address the challenge from the community and park level all the way to national governments and international criminal syndicates. To learn more about the project and its conservation efforts in the Mount Gorongosa area, please read our blog "Elephants hate kale and other lessons in bringing conservation and development together."